Légère et robuste à la fois, cette trottinette 3 roues emmènera votre enfant partout grâce à sa navigation hyper intuitive. Dotée d’un frein facile et efficace, très stable grâce à ses deux roues avant, il pourra naviguer en toute confiance.La Mini Micro se dirige par transfert de poids en s’inclinant légèrement sur le côté. Ce système de navigation unique aide les enfants dans leur apprentissage des fonctions motrices, de leur coordination et de leur équilibre. Tous les déplacements quotidiens de la famille deviendront un jeu d’enfant avec la Mini Micro : les trajets pour l’école, le magasin du coin et les balades du week-end deviendront de vrais moments de plaisir. 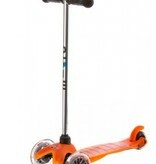 The Mini Micro kickboard is the ultimate quality scooter for young children. Its unique ‘lean-to-steer’ design allows children to steer the scooter by using their body weight to curve from side to side. 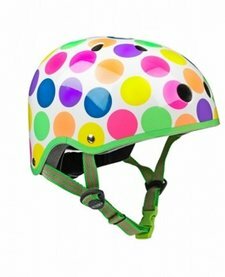 This design puts the rider in control as they enjoy the feeling of ‘surfing the sidewalks’! The Mini Micro is built on a 3-wheeled platform for greater stability and control, allowing children to ride with confidence. The highest quality polyurethane wheels also create a wonderfully smooth glide — and a quiet ride (a joy for both parents and children!) The rear foot brake provides additional control for the rider. Furthermore, the fiberglass-reinforced flex deck is made of soft plastic, thus reducing the risk of injury. Low to the ground and large enough for two feet, the Mini Micro makes it easy for riders to hop on and off or to switch from pushing to simply enjoying the ride. Its light weight makes it easy for parents or kids to pick up and carry when necessary. For added convenience in transportation and storage, the aluminium steering column can be easily detached by way of a child-resistant safety catch on the underside of the scooter. 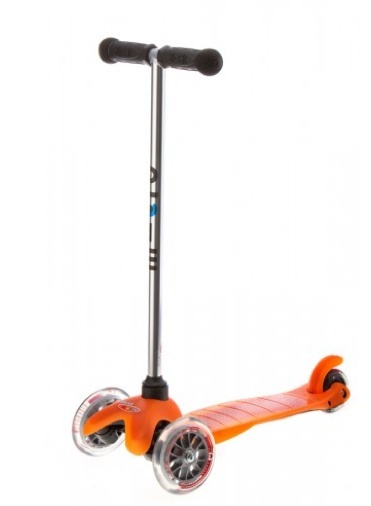 The Mini Micro makes scooting fun for young children and helps them to develop their balance, coordination and motor skills. Moms and dads love it for its ability to get their youngsters moving both independently and, best of all, enthusiastically!